Yakuza 6 is a game of firsts. It’s also a game of lasts. It’s a first because, having creaked along using outdated tech for a number of recent releases, Yakuza 6 is the first game in the series to feel truly “next-gen” thanks to its new “Dragon” (of course it’s called that) engine. You might think that’s awfully late to be joining the PS4 party, since we’re now in 2018, but this game was originally released in Japan in 2016, so that softens the blow a little. And yet it’s also a game of lasts, as series protagonist Kazuma Kiryu—who has starred in not just the contemporary Yakuza games, but its historical spin-offs as well— bows out to make way for new stories and new adventures. If you’re new to the series: please get acquainted. Every single one of these games is weird and special and a total blast to play through, and as much I’d love everyone to jump in and experience the wonders of Kamurocho at the point of their choosing, I don’t think this is the best game to do it. You should probably grab last year’s Yakuza 0 instead. For the veterans, I’m going to start this review talking about the new tech, because it’s not just the most immediate thing you notice about Yakuza 6, but also potentially the most important considering the amount of time it’s going to take to get through this thing. Yakuza 6 looks incredible. Kamurocho’s bright lights shine like never before, and the game’s characters—already a strong point for the series—are now some of the most realistic in all of video games, particularly in the more dramatic, cinematic sequences. The Dragon engine’s changes extend to how Yakuza 6 feels. New character animations mean the game is now a tighter, more responsive experience. Kiryu feels heavier this time around, and moves accordingly, which looks cool in general play but has some ramifications for how combat goes down as well. Fighting in the Yakuza series has always been a wild and slippery affair, built around fast combos, canny blocks and lightning-fast dodges. That still holds true here, to a point, but everything in Yakuza 6 is just a bit slower, more considered, with a greater emphasis on crowd control and strategy than fast finger reflexes. Oh, and most load times are gone too: Kiryu can now just enter and exit buildings seamlessly. This sounds like a minor thing, but it makes a big difference over the course of 50-100 hours, and makes poking your head into Tokyo’s forgotten corners on sidequests a lot more enticing. While many other games would take this kind of technical progression for granted, Yakuza—thanks to its delayed releases in the West and hectic development schedule at home—has always been a very old-fashioned game. Even the two most recent releases, 0 and Kiwami, had their gorgeous cutscenes and realistic city streets offset by things like increasingly ancient animation and JRPG-like text dialogue sequences. So to play a Yakuza game that feels new, and modern, is a big deal! And while the shift hasn’t been without its critics—there are some who aren’t down with changes to the combat, which is understandable—overall, it’s a tremendous feeling to be enjoying the tried-and-tested cornerstones of the Yakuza franchise without also having to endure PS2-era inconveniences. 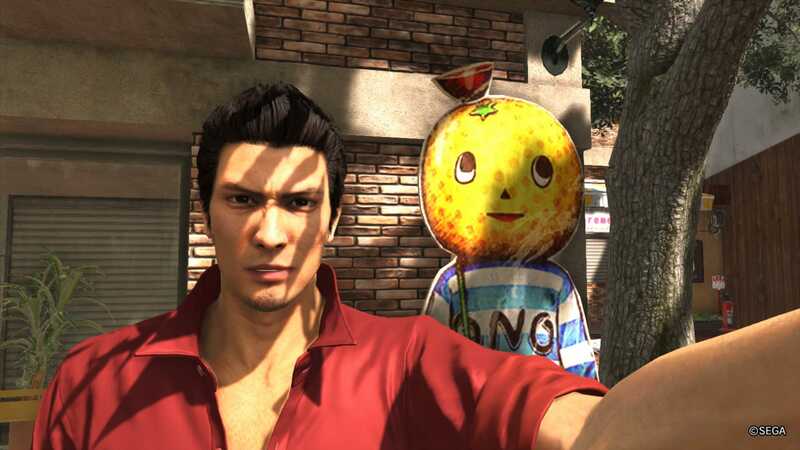 Since the last two Yakuza games released in the West were a prequel and a remake of the 2005 original, it’s been a while since players have been involved in Kiryu’s more recent adventures. Yakuza 6's story gets going—following a customarily lengthy introduction sequence—four years after Yakuza 5's wrapped up, to find Kiryu has done a stint in prison, Haruka has had a baby, been hit by a car and is now in a coma. 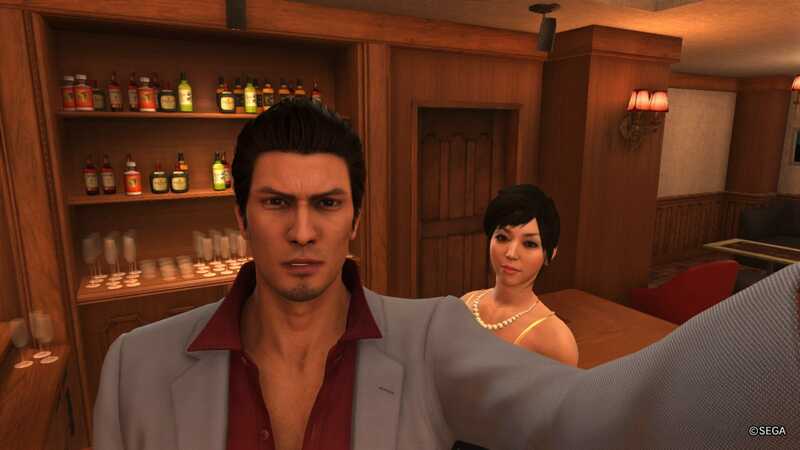 Most of the game’s main quests involve the hunt for Haruka’s attacker and the identity of her baby’s father, which are a mystery (and which later draws Kiryu into a larger Yakuza conspiracy, of course). For a series built on the trashy excess of gangster warfare, these daytime soap opera turns are an unexpected and at times awkward avenue to steer the drama. Which is a polite way to lead into me saying that the main story of Yakuza 6 isn’t a series highlight. I realise there was a very thin line to tread here—balancing the end of Kiryu’s central role in the series while setting the stage for further Yakuza adventures was never going to be easy—but Toshihiro Nagoshi and his team made some curious decisions here, from a bizarre alt-history plotline that feels entirely out of place to a wholly underwhelming cast of villains to the fact Yakuza 6 ignores nearly all of the series’ favourite old characters in exchange for a handful of new faces. My biggest problem with Yakuza 6's story, though, is how it wraps up. This is a game about bringing Kiryu’s story to a close, and Sega had a chance to really do something explosive, bold and brave with it. Instead, despite a shining moment where you think big things might actually be happening, the closing soon takes a cowardly turn and the whole thing just sputters to an end, with a future for the series laid out while doing little to bring what’s come before it to a close. While the absence of old friends is disappointing, the game’s new ensemble do at least have a certain charm to them. Yakuza’s cast is so often made up of sharp-dressed men from big cities that it’s a pleasant change of pace to head to the countryside in this game and hang out with simpler folk who are lower—a lot lower—down the criminal family tree. 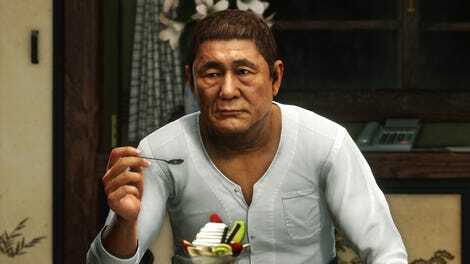 One of those new friends is famous Japanese actor Beat Takeshi, whose performance in this game was one of its biggest surprises. I’d assumed he would be a cameo appearance, signed to appear in some trailers and sell some copies, but he’s actually a principle character, and one you interact with throughout the game. His gravelly performance is a highlight, and helps bring a little gravitas to a cast that’s otherwise big on cornball antics. Of course, all this talk of story and setting only matters if you care about that stuff. 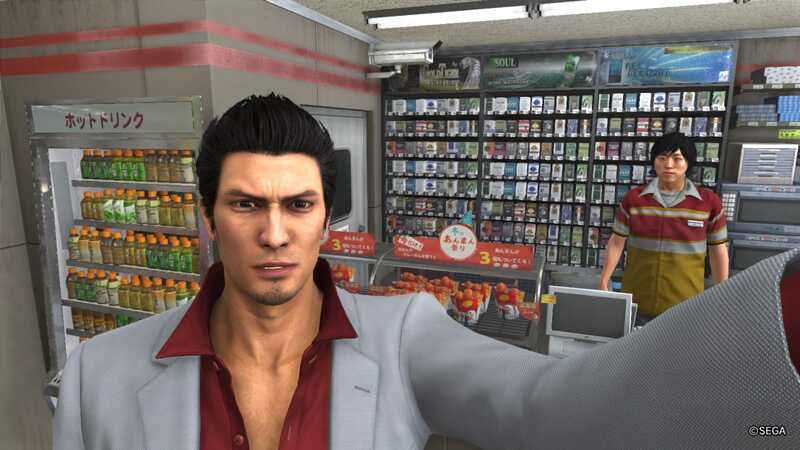 Not everyone is into Yakuza for the drama; this is an enormous game, where the countless diversions and sidequests on offer are as much of the experience as Kiryu’s adventures. If that’s what you’re here for (or most interested in), then you’ll be pleased to here this is the same old Yakuza. There are still loads of things to do, in both Tokyo and Onomichi, along with welcome refinements to your spare time management like a more passive means of helping bystanders (instead of encountering trouble directly in the world its now relegated to an app on your phone) and an eating system — built around XP — that actually encourages you to explore the various outlets and cuisines on offer throughout the game. The revamped camera is another excellent improvement. There have been phone cameras in the series for a while, of course, but did they let you take baby selfies? No, they did not. And while series fans will be used to Yakuza games including multiple minigames for more serious time-wasting, like the ability to manage a hostess bar, Yakuza 6 has gone nuts, adding not just a complete army recruitment/tactical combat system for gang warfare, but a baseball management game as well. What’s craziest about the latter is that it’s this huge, sprawling and detailed management game, complete with stats, and upgrades, and occasional manual player input, and...it’s really easy for players to not even know it’s in the game! Other series would make sure you appreciated all that hard work and effort and probably force you into it, but Yakuza is like “Huh, you know how this series works, it’s here if you want it, but cool if you don’t”. BACK OF THE BOX QUOTE: "Excuse me, is this your bike?" LIKED: It's yet another lengthy crime drama full of fantastic combat and more sidequests than I ever had time to finish. Only now it actually looks like a PS4 game. 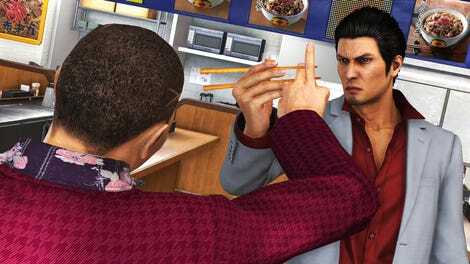 DISLIKED: Yakuza 6 blows Kiryu's farewell, which is a bit of a shame. PLAYED: Around 60 hours, half of which was spent completing the main storyline, the other half of me living my best Kamurocho life. If you look at Yakuza 6 in strictly narrative terms, as the Kazuma Kiryu game, you might be a little disappointed here. The lack of involvement from old friends, and the manner with which his departure is handled, feel rushed and inconsequential when you consider how much he’s been through over the years. As a complete Yakuza experience, though, things are much more positive. Given the technological advances made here, and its breezier outlook on life with a cast freed from the confines of Yakuza’s dense lore, I’d prefer to look at this as the first of a new breed of Yakuza game. One that keeps much of what we love about the series—the karaoke, the fighting, the tattoos—but which also realises that it’s 2018 (or was 2016 when it first came out), and that it was time for the series to finally leave 2005 behind. Even if that means leaving Kazuma Kiryu behind with it.